GSMArena team, 24 February 2017. The Galaxy Tab S3 offers a really slick and clean look, perhaps even more so than its Tab S2 predecessor. Samsung has stuck with a slightly older aesthetic - round edges on a metal frame all around, complete with flat surfaces for both the back and front. It kind of reminds us of the Galaxy S6 in this respect, although the latter does have a distinct chamfering on the sides. The older Tab S2 had a similar visual detail as well - a reference to the aforementioned Galaxy S6, or perhaps the Galaxy Note 4. The new Tab S3 ditches all these subtle design details and offers an extremely clean and uniform look all around. In fact, you might easily mistake it for the Tab A 10.1 (2016) at first glance. One detail that instantly gives the Tab S3 away in this comparison, however, is its noticeable thinness. It measures just around 6mm and unlike the Tab A 10.1, has no camera hump. It is also quite light, considering the 9.7-inch pane and tips the scale at 429 grams and 434 grams for the Wi-Fi and LTE versions, respectively. This is a veritable testament for the importance of battery technology and its constant improvements. While the Tab S3 might be a little thicker than its predecessor, it does carry a bigger 6,000 mAh battery, all while managing to remain lighter. And when dealing with a tablet device of this caliber, weight is definitely a bigger issue for prolonged hand-held use, rather than a few millimeters here and there. 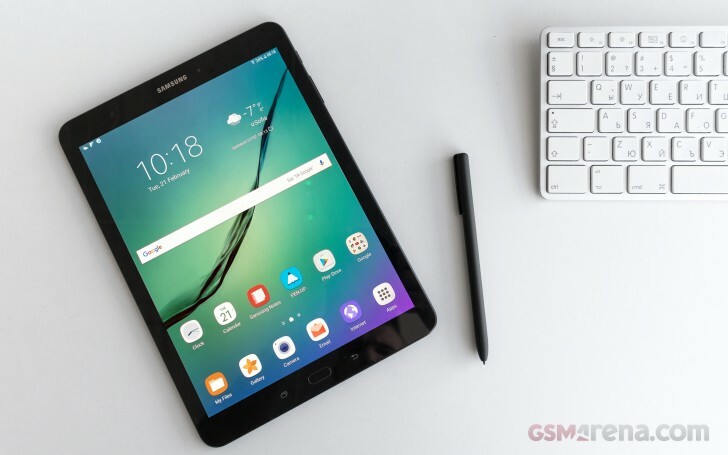 Besides, you might be able to avoid tiring your hands all together, since Samsung definitely envisions using the Tab S3 as a 2-in-1 style device. This is clearly evident by the set of 6 pogo pins and pair of mounting holes on the left side of the unit. This is definitely a novelty for Samsung and a clear indicator that the Korean giant is trying its hand at the 2-in-1 form factor, which has, indeed, been experiencing a surge in popularity lately. This move, combined with the apparent absence of an 8-inch model this year, could hint at a possible re-imagining, of sorts, of the purpose and market standing of the Tab S lineup. If Samsung plays its cards right and releases some interesting keyboard offers, perhaps complete with added productivity features, like extra battery or expansion ports, it could manage to hop onto the growing wave of laptop converters. For quite some time, the convenient accessory was reserved for Samsung's Note line of tablets. Sadly, Samsung has all but abandoned this device family, so it is a t least good to see that the S Pen in getting a second chance of life. And it really comes into its own on the spacious 9.7-inch panel. 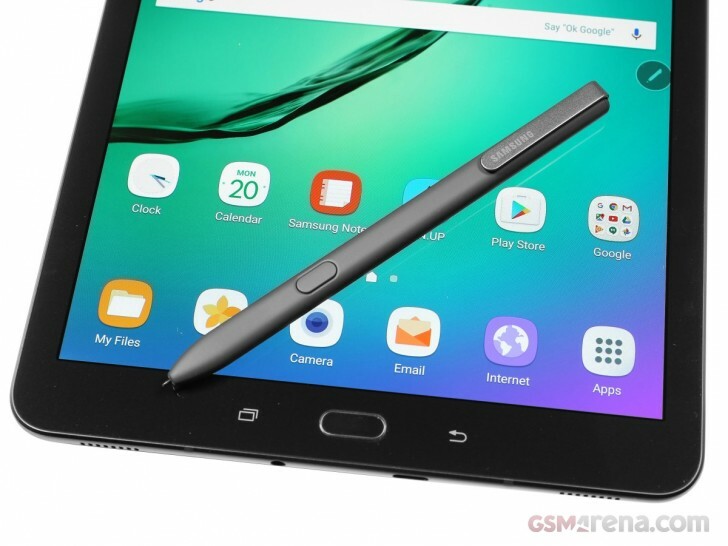 It would have been a nice of Samsung to include a mounting point or other carrying method of some sorts for the pen. But, perhaps, future cases and keyboards will take care of that. More on that later. Continuing our tour of the exterior with the right bezel, it houses the usual set of controls - power and volume. These are positioned near the top, which is convenient enough, especially since it is not really feasible to operate them with one hand. Below that, we find an ejector-style SIM and microSD card tray. There are two separate compartments here, no hybrid stuff. And it is worth noting that there is a Wi-Fi only model of the Tab S3 that skips on the SIM card. The tray is flanked by a pair of microphones on either side. The Tab S3 does appear to utilize these for directional audio in video recording. Speaking of audio, the unit has a whopping four speaker configuration with a 0.64 Wat output. 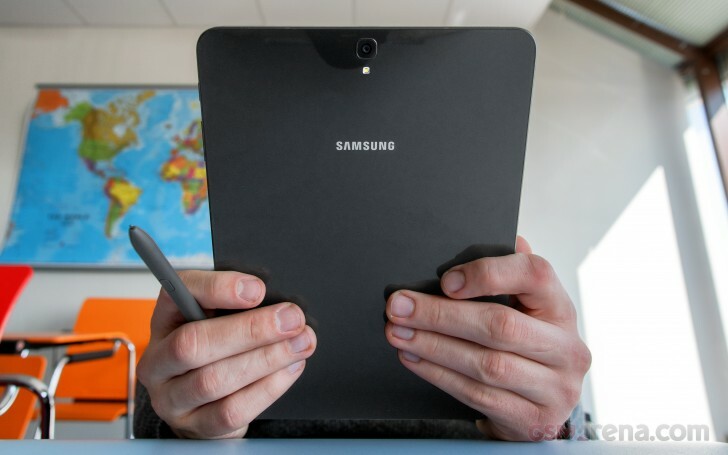 Samsung is taking some pointers form Apple and the iPad Pro on this one. The quad stereo speaker setup was tuned by AKG, by HARMAN and promises premium audio quality. Coupled with the sharp Super AMOLED panel with HDR support, it makes for a truly outstanding multimedia experience on the Tab S3. Apart from the speakers, the top of the Tab S3 is empty. The bottom also houses a USB Type-C port and a 3.5 mm audio jack. To top things off with the physical tour, the Tab S3 sticks to the traditional Samsung button layout on the front. This includes a physical home button, combined with a fingerprint reader. Left of it is a recent apps capacitive button and a back button on the right, Naturally, both are illuminated. Above the display, we only find 5MP selfie camera and a light sensor. Sadly, no notification/status LED here. While it's not exactly justifiable to hold a grudge against the Tab S3 for not covering an IP68 rating, it does seem like a missed opportunity. We understand the pogo pin situation is rather delicate, but Samsung's waterproofing has now become part of the A-series of smartphones, as well as the flagship S models. If the Korean giant had incorporated it into the tablet line, it would have definitely helped them, stand out on the market.